Home News Local News To CEIDC or not to CEIDC? To CEIDC or not to CEIDC? CROCKETT – The trial of Crockett City Councilman Michael Christon “Butch” Calvert versus the City of Crockett got off to a sputtering start on Monday, Sept. 17 as visiting Judge Dwight L. Phifer postponed the proceedings until Friday, Sept. 21 at 3 p.m.
At issue is whether to place a referendum on the November ballot which would determine the fate of the Crockett Economic and Industrial Development Corporation. Calvert, represented by Crockett Attorney Lynn Markham, brought suit against the city after the city council voted not to place the referendum on the ballot despite a legally valid petition to do so. The city is being represented by Houston-based attorney Carroll G. Robinson. Robinson is affiliated with the Robinson Law Group in Houston and the Rosen Law Firm in New York. His retainer is $3,000 and his fee schedule is $250 per hour for his services, $100 per hour for legal associates and $15 per hour for administrative assistants. Both Phifer and Robinson were needed for the trial due to recusals from 349th District Court Judge Pam Foster Fletcher and 3rd District Court Judge Mark Calhoon. In addition, Crockett City Attorney Bill Pemberton had also recused himself. Pemberton cited Rule 3.01 of the Texas Disciplinary Rules of Professional Conduct. 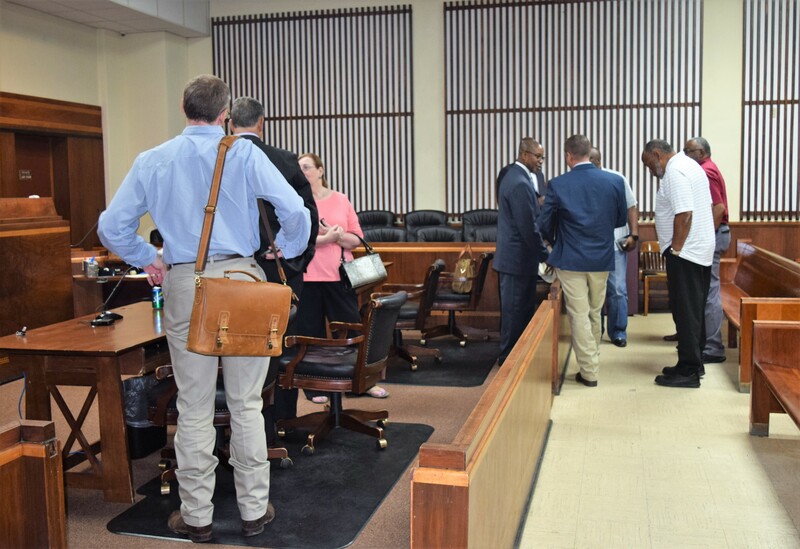 After meeting with both parties and their attorneys, the judge reasoned because Robinson had formally been retained by the city of Crockett in a meeting only two hours prior to convening the court hearing, the defense team should have more time to prepare their case. “I’ve literally just been given this case. In the short time we’ve been here, we have seen a multiplicity of questions which have come up. I haven’t had a chance to talk to everybody yet. I haven’t had a chance to do my due diligence in terms of legal research. We are literally guessing at election deadlines as we are trying to do this on the fly,” Robinson said. After several minutes of consideration, the judge rescheduled the legal proceedings for Friday, Sept. 21 at 3 p.m.